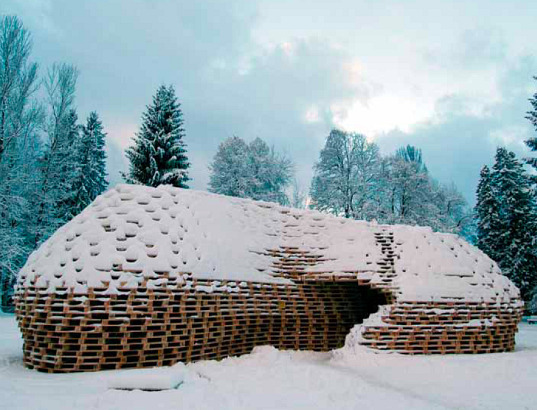 Back in 2005, Matthias Loebermann built a beautiful temporary pavilion out of reclaimed shipping pallets for the Nordic Alpine Skiing World Championship in Oberstdorf, Germany. Shipping pallets are found all over the world and make for a sturdy low-cost building material, which accounts for the remarkable rise of "Palletecture" projects as of late. Loebermann designed and built this pavilion out of 1300 shipping pallets and held them together using tie rods and pull straps. At night the interior was lit with a lamp and glare reflectors that brilliantly shone out through the gaps of the pallets. The temporary pavilion was used as a meeting place and media room for athletes and press to come to after their competitions. At the time of the skiing competitions, it was obviously winter and the structure was often covered in snow. As the pavilion was constructed of only tie rods, straps and pallets, dismantling and recycling the structure was quite simple after the competition was over. Loeberman used pallets to encourage people to look at the common item in a new light as a building material — back in 2005, this concept was still relatively new for most people. 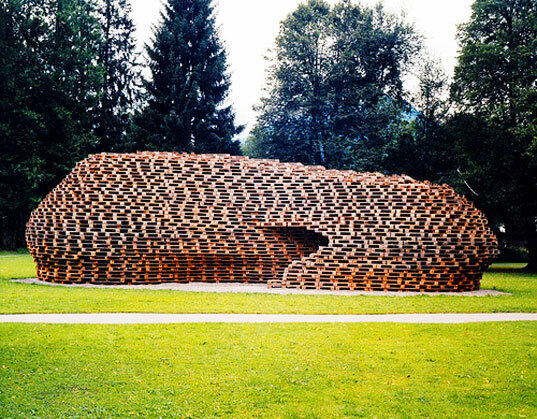 The pavilion was designed and built by Matthias Loebermann with the help of Berit Richter and architecture students from University of Biberach. The temporary pavilion was used as a meeting place and media room at the Alpine Nordic Skiing Championships in Obertsdorf, Germany in 2005. It was constructed out of 1300 shipping pallets, 20 tie rods and 100-6 meter compression straps. The pavilion is shaped by stacking the pallets on top of each other in a curvilinear design that forms a spiral. A lamp was placed inside the structure with reflectors. At night the light shone out through the staggered gaps of the shipping pallets. The pavilion was mostly used in the winter during the championship and was left standing for a time afterwards. Loebermann wanted to design and build a structure that would identify with the surrounding region, which is heavily forested, so he chose wood. Shipping pallets were selected as the building block in order to get people thinking about the common item as a new building material. The pavilion measured 6 meters high, 8 meters tall and 18 meters long.